He expressed love and fondness for the people of Canada and reminisced a bit about the time he and his wife, Frances J. Monson, and their children lived in Toronto three years as he presided over the Canadian Mission, beginning in 1959. Their oldest son, Tom, was nearly 8 years old when the family moved to Canada in the spring of 1959. Their daughter, Ann, was nearly 6, and their youngest son, Clark, was born in Toronto. “Although many of our dear Canadian friends have passed on, there are those who remain still — as well as the children and grandchildren of those stalwart saints of years ago,” President Thomas Monson said. 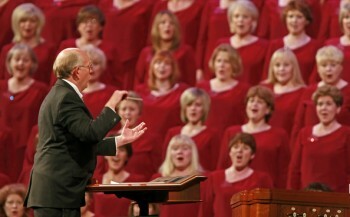 . .
. . .Mormons experience the show like looking at themselves in a fun-house mirror. The reflection is hilarious but not really you. The nose is yours but swollen out of proportion. Take the issue of getting your own planet, for example. Elder Price talks about a planet for himself and one for Jesus. Those are not really core Mormon beliefs. Mormon scriptures and Church leaders don’t say anything about people getting their own planets. The idea is more like lore than doctrine. Mormons do believe in the principle of theosis, the doctrine that God wants humans to become like himself–in effect gods. That belief leads Mormons to speculate about creation. Will beings with god-like qualities have the powers to form earths? Perhaps, who knows?. 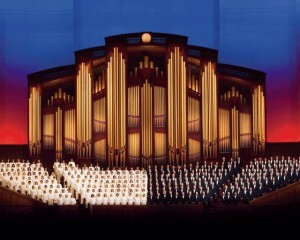 . .
TORONTO, Ontario — Professing “there is no finer choir in all the world” than the Mormon Tabernacle Choir, LDS Church President Thomas S. Monson welcomed invited guests to the final concert of its summer tour. Speaking at a reception prior to a concert Monday evening in Roy Thomson Hall, President Monson said that when he became president of The Church of Jesus Christ of Latter-day Saints in 2008, he appointed himself as adviser to the Mormon Tabernacle Choir, which includes the Orchestra at Temple Square and the Bells on Temple Square. It is, he said, one of his favorite assignments. . .
For more articles and Mormon News, please visit LDS.net or the official Newsroom of The Church of Jesus Christ for the latest in LDS News.